Back in elementary school (around 5th grade if I remember correctly), my Cheylin Elementary School classmates and I took a field trip to the Kansas Cosmosphere and Space Center in Hutchinson, Kansas. To be honest, it was one of the field trips that every Cheylin student looked forward to. Not only did you get to spend a whole day out of the classroom, but you got to learn some really cool stuff about space in a very kid-friendly atmosphere. Between the museum, the live rocket demonstration, the planetarium show, and the IMAX movie that always made at least a couple of the kids and/or chaperones sick, it was just a day well-spent. By the time we were let loose in the gift shop at the end of the day, most of my classmates were already planning their careers as astronauts and formulating very thoughtful arguments to present to their parents about why they needed to be enrolled in the Cosmosphere’s popular Summer Space Camp. The few students who weren’t dreaming of future flights to space were at least fascinated enough by the experience to buy a small space-themed souvenir or a package of freeze-dried Astronaut Ice Cream. Don’t get me wrong, it’s not that I wasn’t interested in space. Truth be told, I’ve always had a healthy fascination with what lies beyond what our human eyes can see. I love learning about space, seeing photos from the Hubble telescope and the Mars Rovers. Hell, I even enjoy reading about alien encounters and crop circles. Luckily the dolphin trainer and trapeze artist phases were shortlived. Thank God good sense prevailed, huh? So, cruising through the gift shop, there wasn’t much that was really catching my eye until I came across the little Pin Art toy. Normally, my Mom probably would have tried to talk me into a more suitable space souvenir, but she was still a little motion sick from the IMAX experience. So, $7 and tax later, I was the proud owner of what still happens to be hours of fun. And while my classmates were sampling their space ice cream, I was busy making artistic impressions of my face. 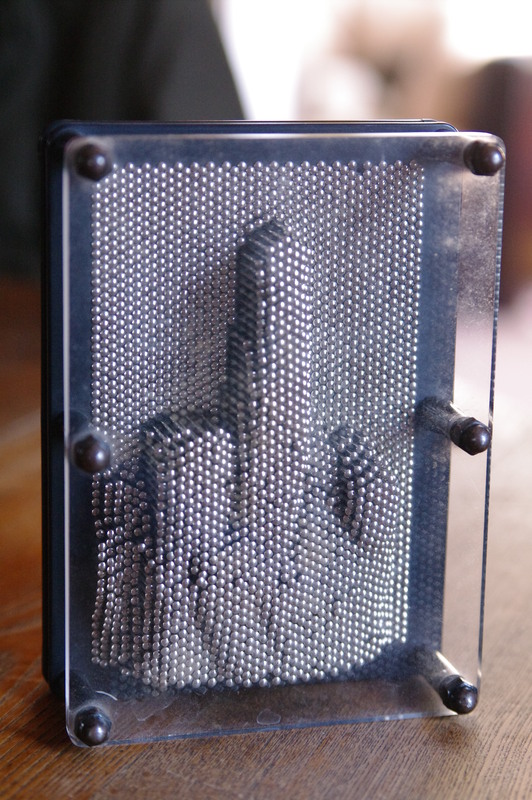 Over the years, my Pin Art has always managed to find a prime spot on my shelf where I could create whatever pin impression happened to fit my mood. 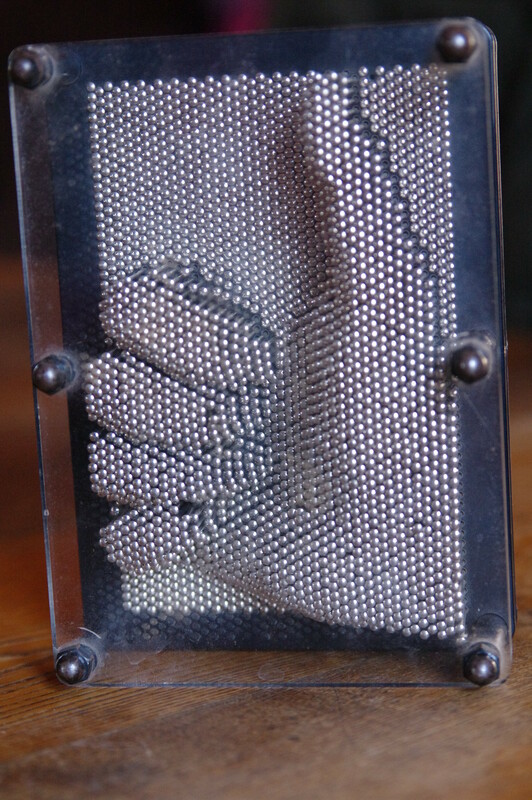 And in the days before epic online time wasters like Facebook and Pinterest, I would work through my writer’s block playing with my favorite pin art toy. Yeah, that was always fun to explain to my mom when she found it. I mean, I once saw her chase my 30-year-old Uncle Tim around the house trying to wash his mouth out with soap when he cut open his hand carving the Thanksgiving turkey and accidentally let a loud F-Bomb slip. 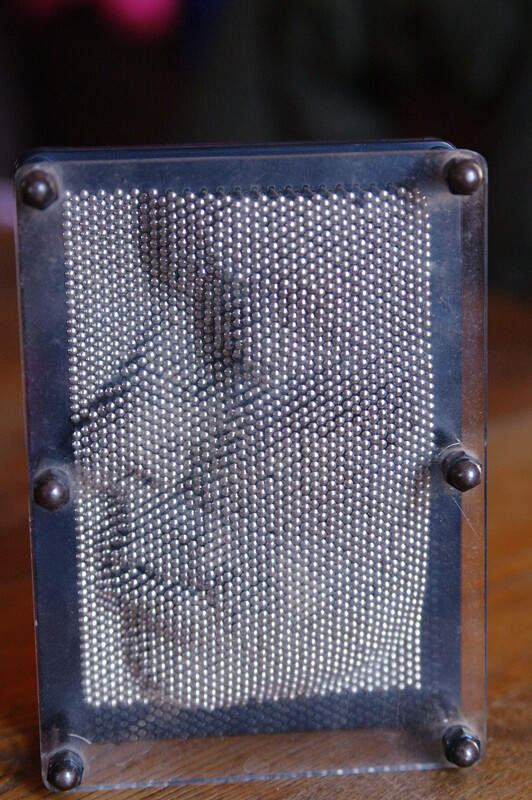 So, you can imagine what it was like having to explain to her why my Pin Art always seemed to be flipping her the bird when she walked in my room. 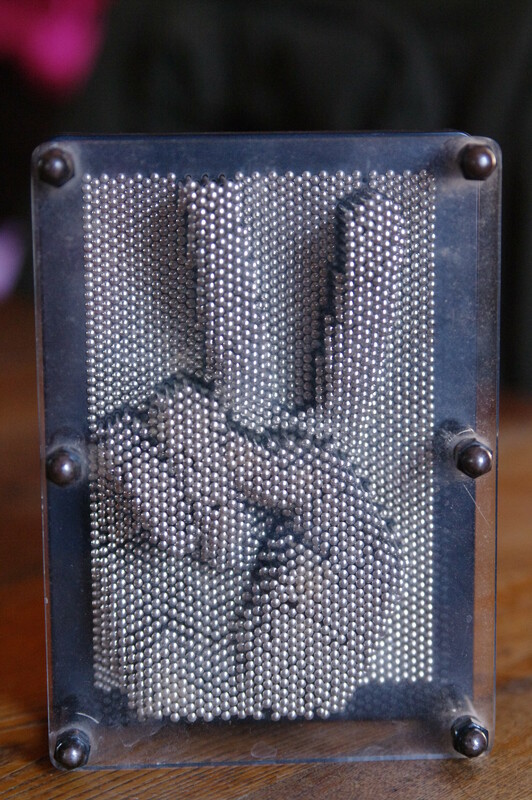 So, for tonight (and for my mom’s sake, since she reads this blog religiously), I’ll leave you with a kinder Pin Art gesture. 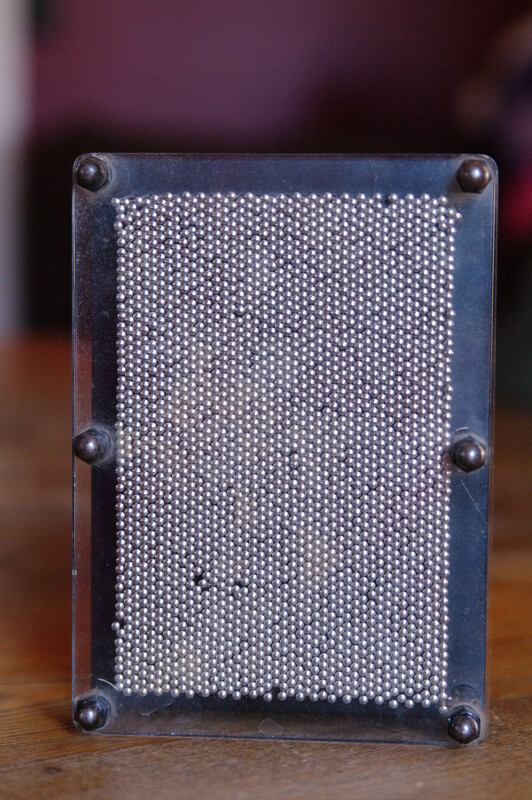 And while my husband was certain he would see the ol’ Pin Art getting tossed in the trash during this excavation, I have to admit, I’m keeping it around a little longer. The way I see it, it’s always a good idea for parents to have a secret stash of cool toys to pull out when the kids are getting really obnoxious, and this is one that pretty much guarantees hours of fun. TWINS AGAIN! I wanted to go to college for marine biology so I could work at Sea World (as an otter or sea lion trainer, though) but my dad said there’s no money in marine biology. But he was cool with me becoming a writer…? Duuuuuude! Seriously, I think we were separated at birth! I wanted to study marine biology too so I could be a dolphin trainer. I read a book in like 3rd grade called “The Dolphins and Me: A True Story” by Don C. Reed and that was it. I was totally hooked. I’m pretty sure my parents thought I was a lunatic because we were living in Kansas at the time, which is about as far as you can get from an ocean. Plus, I had never even seen an ocean. But hey, a kid can dream, can’t she? That was a great trip! I’ll have to admit that this little remembrance is one of the coolest I’ve ever seen. I’m glad you didn’t mention me slapping Pillsbury without even thinking when he dropped the “F” bomb at Tuffy’s in Smithfield. Haha! I was going to mention that too, but I didn’t remember it was Pillsbury! 🙂 Love you Mom!